When you first start out on a Ketogenic diet, you might be intimidated going out to eat at a restaurant. However, eating while out and about can be pretty easy with some modifications. You should be able to find some Keto friendly meals at most places if you know what you are looking for. If you are the type who doesn’t like to speak up, eating out on a Ketogenic diet might be a little tricky. Don’t be afraid to speak up and ask for what you want when at a restaurant. Most places are quite accommodating. You aren’t the only one asking for modifications these days! Always read the description. When in doubt, ask for the ingredient list. Restaurants are required to have this available to you. Go for meats, vegetables, and cheeses. Stick with simple ingredients like these and you shouldn’t have a problem. Look at the appetizers. These will naturally be a smaller serving size, so even if you go over on carbs, it won’t be nearly much as a full entree. Avoid anything breaded, and ask for a burger or sandwich without a bun. Some places will wrap your burger in lettuce wraps, which is even better. If you have to choose something breaded, just try to take off as much of the breading as you can. This should be obvious, but avoid french fries and onion rings! Check out this post on our page to see some fast food options ahead of time. Be careful with condiments. Avoid any sweet tasting sauces, like barbecue, ketchup, or honey mustard, since they have added sugar. When there is no high fat alternative, you can always ask for a side of melted butter. If you order a salad, ask for high fat dressing, like ranch or bleu cheese. Balsamic dressing has lot of sugar. Avoid croutons and any salads with fruit added. Buffalo wings, as long as they are not breaded, are a good choice paired with a high fat dipping sauce. Avoid sauteed onions, as onions caramelize when sauteed and end up with more sugar. Sauteed mushrooms are a good choice. Gluten Free does not mean Carb Free. Many of the gluten alternatives can spike your insulin just as much as wheat can. If you order a steak, ask about any sauce it comes with, as many have flour added as a thickener. Ask for some butter or a garlic sauce, or a cheese based sauce. Spinach dip is a great option, but pair it with some celery sticks, or pour it over your steak or chicken. It is delicious! Broccoli with cheese is a good choice for a side with your meal. If you order baked chicken, try to keep the skin on to add to your fat content. Some places have mashed cauliflower as an alternative to mashed potatoes. A Cobb salad is a great idea, as it contains plenty of healthy fats and not an excessive amount of protein. Don’t go out to eat when famished, if at all possible. Try to fill up a little before you go, even if it is a fat bomb, so you aren’t too tempted. 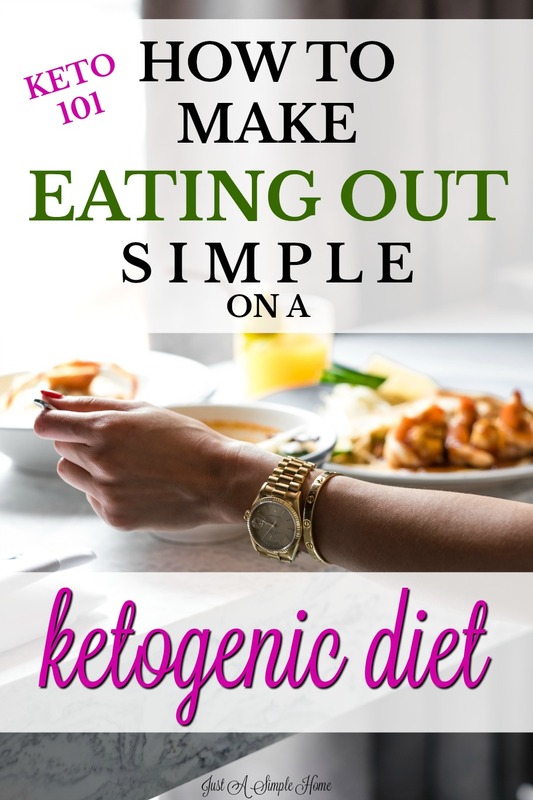 If you are drinking Exogenous Ketones, drink one about an hour before you go so your appetite and cravings are suppressed and you stay in Ketosis. Check the restaurant menu online before you go so you can be as prepared as possible ahead of time. Remember, most restaurants are very accommodating. Do not be afraid to ask for what you want and omit the things you don’t. There are so many hidden carbs in foods that we really have to be careful with what we order. But, if you take a little time and do some investigating, you can eat on on a Ketogenic diet and still have success! IF YOU WANT SOME SUPPORT ON YOUR KETOGENIC JOURNEY, CLICK THE IMAGE BELOW TO JOIN OUR FREE COMMUNITY! Great tips, Terryn! I’m often nervous about finding something to eat when going out, but I love your suggestion to order appetizers as a safeguard. Cobb salads are one of my favorite things to order – so many delicious and healthy ingredients!